I'm in Launceston with Clare this weekend, having the mountain biking / adventure weekend that we planned to have last weekend except it all turned out to be too hard so I stayed in Hobart. And it was for the best in the end as I was sick last weekend anyway. Anyway - first on our Launceston hit list was Hollybank - it opened up last year. We did 'No Sweat' twice, and 'Tall Timbers' once - it was pretty good fun despite our technical rustiness. 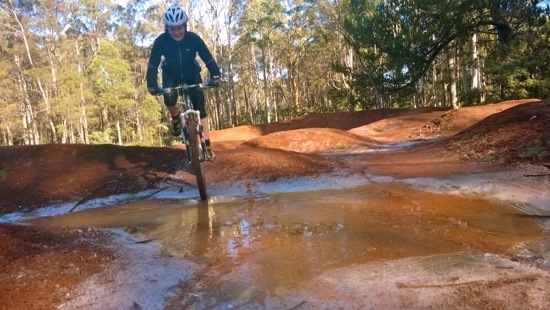 After our loops we had a quick play on the pump track, riding through the icy puddles (that's my problem with Launceston actually, everything is still icy and frosty at noon, despite the sunniness and cloudless skies) . Next up is orienteering at Trevalyn.